I’ll be doing this kind of entry with every bootcamp I’ve applied to and be critiquing on positives and negatives along the way. I think it’s important that people have an honest look at each bootcamp. That being said, I’m not releasing anything here without DevLeague’s permission. I decided to apply to DevLeague since they were the first of their kind in Hawaii. I have some connection with Hawaii. I’ve actually never been, but I was initially going to attend Hawaii Pacific University as a double major in Computer Science and Integrated Multimedia with a very large scholarship. Since I had enough credits from high school, I’d still be able to graduate in 4 years. I even had a party a few months before school started because I was certain at that point I was going to attend HPU. It was a win-win situation, but then out of the blue, in July, I got accepted to Jacobs University with a medium-sized scholarship and decided to go there for the 3-year CS program. I don’t regret my decision, but since then, I’ve always had the desire to get to know Hawaii but obviously had no chance for financial reasons. DevLeague would be a practical way to do this. I’m also considering going to UH at Manoa for my grad studies in CS so there’s that too. You fill out the virtual application for DevLeague here. Like Fullstack, the application didn’t involve a lot of effort, just basic background info (employment, coding abilities, cohort choice) and two small essay questions. The essay questions are right now: Why would you like to attend DevLeague? and Tell us a little bit about yourself. Once you fill this out, they’ll send you an email shortly afterwards where you will schedule a virtual interview through Skype with one of the co-founders, Jason. Again, the process overall was clean, efficient, and very organized. No problems here. Jason was a great interviewer! All around chill guy and I was comfortable all throughout the interview. He was really informative as well and told me everything I needed to know about DevLeague in great detail. His friend and co-founder of DevLeague, Russel, who was also with him at the time, was also quite amiable. Yield rate - out of the applicants you accept, what percentage end up attending? It’s around 30% and part of that is because we’re a very new bootcamp. For 35 students, we had over 115 applications. How many drop out after simply experiencing the pre-work? Well, the coding challenge depending on your knowledge takes 2–4 weeks possibly. Pre-work takes roughly 40–80 hours of self-study. Yeah, people do drop out and it happens very regularly that people don’t finish the coding challenge. Fortunately, I don’t usually have to make those kind of tough decisions because generally people who don’t finish the challenge are the ones that reject themselves. If they’re putting time in, then that means they’re dedicated to it. I made an exception once because a student felt he had too much work going on and it didn’t work out at all. We try as much as we can to see these things coming - if they need more help, we’ll try and help them out. What we have no control is the amount of effort they put in. If it’s not a situation that’s working out, we do ask them to leave. They have 4 weeks to make a decision for staying in program. How many college students have you had in the past? We get a lot of college graduates actually. We’ve had a few colleges students. At least a couple. In terms of other students, the backgrounds are all over the place, but they all have the motivation - these are people wanting to make a change professionally. What kind of process do your instructors go through? They know a little bit of programming, are knowledgable in industry, have multiple projects/multiple systems over many years, and have 10 years or more of professional web development. What do you guys recommend students do outside of the course? We make our students go to Meetups. Our current cohort is also highly encouraged to attend Startup Weekend and 2 of the 3 winning teams had members of DevLeague on them. Being proactive is something we encourage. Through collaborating and networking, you never know what kind of experiences you might get out of it - so we kind of put the pressure on our students sometimes. In the end, they’re all going to have a website, a couple of projects on GitHub, and an updated LinkedIn profile. This is a great strategy. If you were my age again (I’m 19), would you still attend a bootcamp like DevLeague? Why? I think I would, honestly. Getting a degree got me an interview, but most of the success I had was from free-lancing, teaching myself. It’s crazy how long it took us to learn all this stuff vs how long it takes people these days - it’s just crazy. I wish I had the opportunity to learn that quickly when I was younger. Truth. 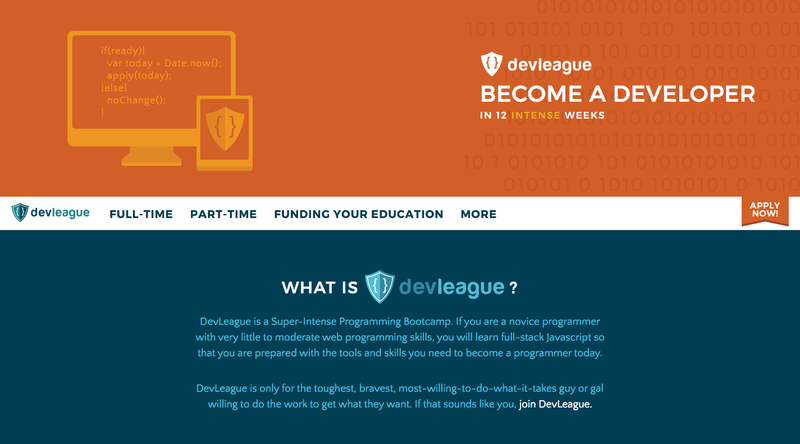 When I was in the process of applying to a ton of coding bootcamps, I came across DevLeague. They were kind enough to feature my blog post in January 2015 on my interview experience with them on their own website through their blog. I thought they were some of the nicest people I came across when the coding bootcamp interview process and definitely appreciate how they’re the only coding bootcamp in Hawaii.